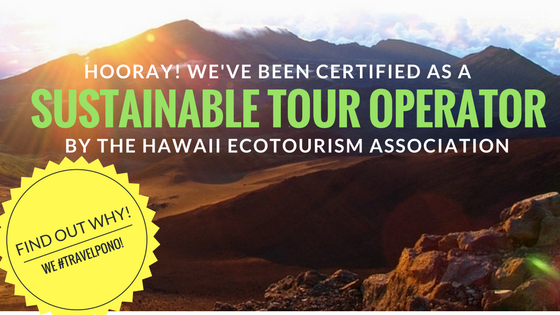 We’re thrilled to announce that Temptation Tours has been awarded with the Hawaii Ecotourism Association’s “Sustainable Tour Operator” Certification! What does that mean? Simply put, it means that the Hawaii Ecotourism Association has recognized us for our commitment to sustainability for our environment, our community, and our culture. Our Hawaii-Certified Tour Guides are well-versed in Hawaiian words and terminology, ensuring that we’re only providing accurate, respectful information about Maui’s people, animals, plants, land, and history. They also embark on a six-week, in-depth training program before leading tours. Our picnic lunches are served on crystalline plates, accompanied by cloth napkins and real silverware, eliminating as much waste as possible from our meal service. Any un-touched food is donated to a local church, who uses it to help feed our community members in need. All beverage containers from tour are collected on-board and recycled. Tours support local businesses, such as Coconut Glen’s Ice Cream, Aunty Nita’s Shave Ice, and Kula Lodge. Our website in blog go in-depth about Maui, its culture, its ecology, and our commitment to sustainability. 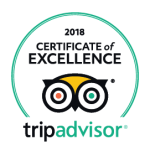 We’re more than thrilled to have received this important recognition from such a respected organization, and are proud to continue to hold up both the HEA’s and Temptation Tours’ standards for quality tours that educate our guests about sustaining our land, our ecosystem, the Hawaiian language, and the people of Maui. We hope you’ll join us soon, and see why we’ve stood out as a Sustainable Tour Operator! 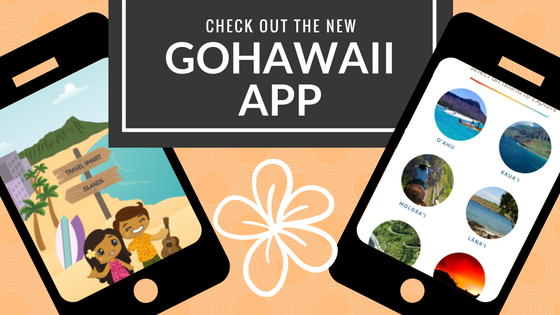 Yesterday, the Hawaii Visitors and Convention Bureau launched the brand-new GoHawaii app. 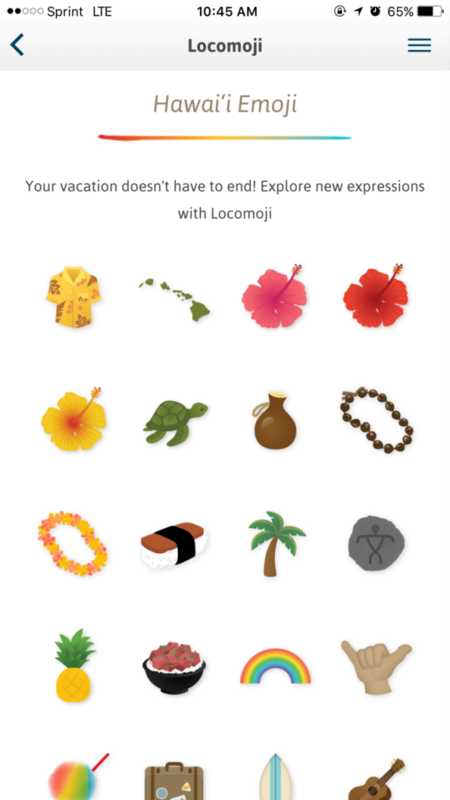 If you’re looking for your go-to app for planning your Hawaii vacation, this is the one to get! It’s available on the App Store for iOS devices, as well as on Google Play for Android. No matter how you connect—GoHawaii is available for all your vacation-planning needs! 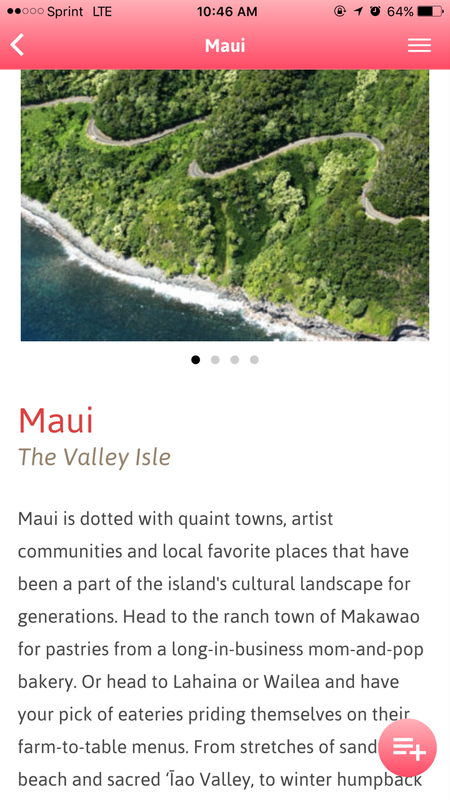 An overview of Maui from the GoHawaii app. In the “Islands” section, you’ll get an overview of each of the six main Hawaiian Islands to which you may be traveling: O’ahu, Kaua’I, Moloka’I, Lana’I, Maui, and the Big Island of Hawai’i. Tapping on each will take you to an overview of the island, including the main points of interest, as well as a slideshow of photos. From there, you can check out Sites & Attractions, Events, Travel Tips, and Weather for each island. You’ll also find a list of helpful phone numbers to keep handy when visiting each island—like the airport, hospital, and visitors’ bureau! Interact with this fun scene to learn important water safety tips! In the “Travel Smart” section, you’ll find interactive pages with tips to stay safe and secure while visiting. 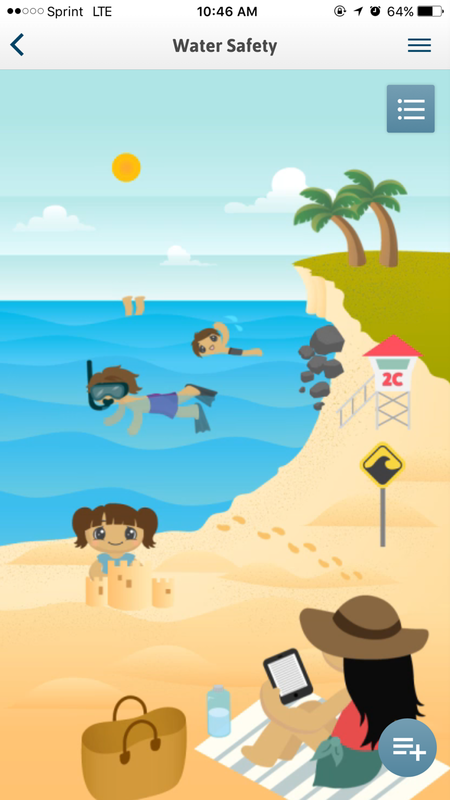 You can interact with fun, illustrated scenes that highlight Water Safety, Disaster Preparedness, Marine Protection, and more. It’s a great idea to check out each scene, and prepare yourself for any eventuality while visiting Hawaii! You can also add particularly helpful tips to “My List,” that you can access later at any time. This feature-rich app is free to download, and can be a valuable part of your vacation plans! One question that we hear often from potential guests is, “Why Temptation Tours? What makes your company different?” Really, there are so many answers to that question, sometimes it’s hard to know where to begin! Here are some of the things that set Temptation Tours apart. If comfort is a big priority for you when choosing a tour company, Temptation Tours has you in mind. Each of our spacious, eight-passenger Luxury Limo-Vans is equipped with a leather captain’s chair for each passenger, so even on a full tour, everyone has room to relax and enjoy their experience—without that “sardine-can” feeling. Our beautifully-appointed vehicles also feature plenty of cup-holders, so you can enjoy the ride accompanied by an ice-cold bottled water or tropical soft drink. While you’re heading to Hana, or making the journey to the Summit of Haleakala, you’ll enjoy beautiful views, thanks to our oversized, polarized, panoramic windows. Are you looking for something different? Our tours offer attractions and sights not found anywhere else. From our Haleakala Sun-Trek (which includes a tour of Ocean Vodka, Surfing Goat Dairy, as well as an exclusive helicopter flightseeing tour above Haleakala) to our Hana Cave-Quest (the only guided tour on Maui that includes an in-depth tour of the Ka’eleku Caverns), our tours are anything but ordinary! If you really want to experience something to write home about, we’d love to show you what we do! Whether it’s a mouth-watering breakfast at Kula Lodge, or a delightful Pacific Rim Cuisine picnic on a beach in Hana, we know that exploring the ins and outs of Maui’s natural sights can make someone hungry! Every tour we offer provides at least one meal, and we have no problems with special requests! Vegetarian? Vegan? Gluten-free? Let us know! Apart from our professionally-catered picnic lunches, some of our tours visit Maui’s most acclaimed restaurants, such as Café Mambo in Paia and the Travaasa Hana’s Ka’uiki Dining Room. Whether you call, email, or leave us a Facebook message, our dedicated customer support team will respond within twenty-four hours (typically much sooner) to answer questions, assist with your reservation, or respond to your feedback. Every single guest receives a day-before confirmation call, whether on your provided cell phone number, or at your hotel. We’re also here to assist you in getting the best price possible for your tours—and to help familiarize you with the island of Maui before you even arrive! There are plenty of things that set our tours apart from others, but nothing compares to our expert Tour Guides. Each one has gone through a rigorous training program, and has been certified by the State of Hawaii as a professional Tour Guide. They provide insightful, educational information, as well as five-star service on each and every tour. While other tours may operate on a “bus-stop” schedule, our Tour Guides are with you each and every step of your journey, offering narration and interaction at every stop. Additionally, our Tour Guides are some of the nicest, funniest, most interesting people you’ll ever meet, and they’re all incredibly enthusiastic about their jobs! A day spent with one of our Tour Guides will be the highlight of your Maui vacation. Again, there are plenty of reasons why Temptation Tours has the reputation it does, and why we’ve been in business for almost thirty years. 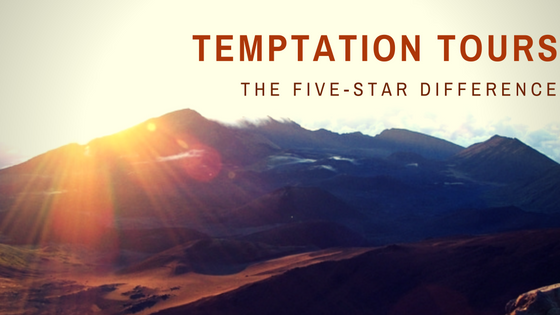 Join us during your Maui vacation, and experience the Temptation Tours difference for yourself! 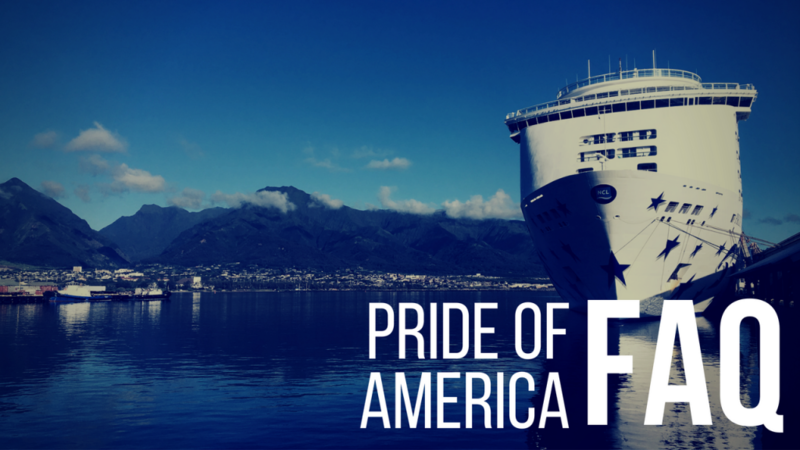 Every Sunday morning, Maui welcomes Norwegian Cruise Line’s Pride of America into Kahului Harbor, along with up to 2,100 passengers, ready to explore the Road to Hana, Haleakala Crater, and more. Every week, Temptation Tours welcomes many Pride of America passengers aboard our eight-passenger Luxury Limo-Vans for adventures around Maui. We field numerous questions from cruisers in the planning stages almost every day, and we’re always happy to help! Here you can find some of the most commonly-asked questions from guests aboard one of Hawaii’s most iconic cruise ships. Do you pick up from the Kahului Harbor? For our land-based tours, we will pick you up across the street from the Kahului Harbor, at the Maui Mall. This avoids the crowds, confusion, and congestion at the ship’s pier. From exiting the ship, it’s approximately a seven-minute walk, all on pavement and sidewalk. Once you make this easy walk, your Tour Guide will meet you at the “Maui Mall” sign, in front of Longs Drugs. Once you book, we’ll send you detailed directions on where exactly to go. If you’re booking the Hana Sky-Trek, your tour will both start and conclude at the Kahului Heliport—a short taxi ride away from the harbor. If I book on a Monday, will I return to the ship on time? Absolutely! We host hundreds of guests from the Pride of America each month, and all of our Tour Guides are well aware of the “all-aboard” times. We’ve designed our tours to ensure that you have a relaxing, enjoyable day, and get back in plenty of time to depart for your next port of call. Are there any tours I can’t book? The Pride of America’s schedule precludes booking an AM Sky-Trek and a Haleakala Sunrise on a Sunday, due to the ship’s arrival time. Otherwise, all tours are fair game, subject to availability! Keep in mind that days that the Pride of America is in port are very busy, and space fills up quickly. It’s best to book your tour with us as soon as possible! Do you offer any discounts to Pride of America guests? Yes! By booking directly with us, you’ll receive up to a 15% discount on all of our tours, saving you up to $40 per person over booking with a third-party booking agency. 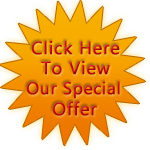 You can also take advantage of our Special Cash-Back offer! My cruise is booked for next year—can I book tours now, or do I need to wait until closer to my sail date? You can absolutely book now! For advance bookings, please call us directly at 1-800-817-1234 for availability. We want a shorter tour, or a tour that goes somewhere different from your listed tours. Is that possible? Sure! We’re thrilled to offer Private Charter tours for Pride of America guests. Call or email us with what you’d like to do and see, and we’ll create a custom tour just for you. We hope this helped answer some questions you might have about joining us from your inter-island cruise! Of course, if you have more questions, please get in touch with us! We can’t wait to be a part of your next cruise. When you’re on Maui, your days are most likely filled to the brim with what to do. Snorkeling, souvenir shopping, sightseeing, and more will keep you busy all day long. While the excitement of visiting this beautiful island is sure to keep you going, sometimes you might just need an extra pick-me-up in the form of a nice cup of coffee. While there are Starbucks to be found almost everywhere, we might suggest that you take a few minutes to check out some of Maui’s local coffee houses while you’re here. Located in South Kihei, this tiny, cozy coffee-shop is located in a small, open-air shopping center, next to a moped rental spot. If you’re a coffee connoisseur, this is the spot for you. Their website describes them as having a chic, boho vibe, and that’s certainly a spot-on assessment. They serve up trendy coffee-house standards, like cold-brew and flat whites, but we love their “Tree Sap,” an iced coffee concoction made with local honey and coconut milk. Their baristas are seriously skilled, too; we can never quite get over how beautiful their lattes are! While you’re there, try one of their artisan-style crepes, or one of their simple, delicious tartines. The newest spot on the list, Sip Me finds itself on Makawao Town’s quiet, quaint Baldwin avenue. Sip Me is a “meeting of the minds” of some of Maui’s foremost chefs and local food-makers. While their espresso is a pure coffee-lover’s dream, you should also check out their hand-mixed loose-leaf teas, their locally-made ginger beer, and their fresh, healthful juices. Sit back in their modern-meets-antique-style shop, and enjoy a fresh scone, croissant, or even a gluten-free pastry from Maui Sugar Shop. I’ve been frequenting Wailuku Coffee Company ever since it opened, so of course, this Central-Maui stand-by is one of my favorites. Their menu is seemingly endless, and their enthusiastic baristas are continuously coming up with their own creations—check out the chalkboards near the register for inspiration! My favorite, though, is their simple iced Toddy coffee, which is strong, smooth, and refreshing on a hot Wailuku afternoon. They also boast an impressive pastry case, featuring gluten-free, vegan, and traditional fare. Pair your coffee with their yogurt and granola parfait for an afternoon energy-boost that will fuel you well into your evening! 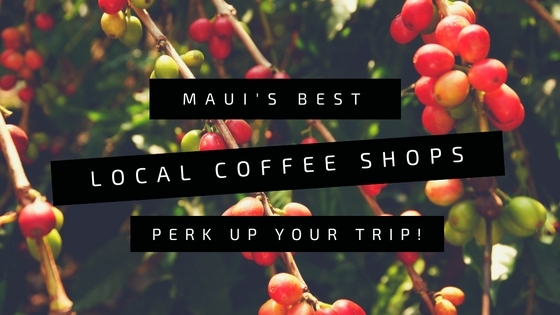 When you’ve simply had enough of the green straw, and you want to get a feel for Maui’s surprisingly-rich coffee culture, check out these spots and more for your Maui mocha fix!